Andipa Contemporary, in collaboration with the Royal British Society of Sculptors, is proud to present a solo exhibition of Kate McLeod, the winner of Spotlight 2014 Award for Sculpture. McLeod’s practice is underpinned by the concept ‘becoming other’. 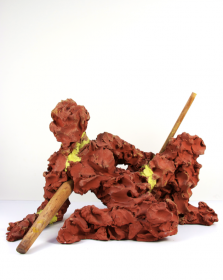 The work is visceral; an expressive pursuit concerned with materiality within a figurative sculptural practice. 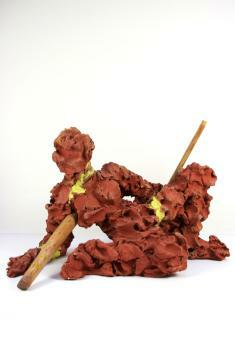 She uses archetypal materials such as clay to work into figures, which are supported by off-cuts and junk. 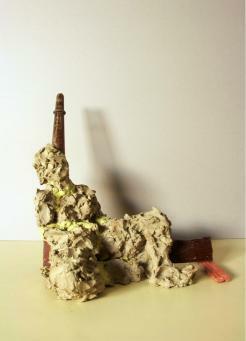 Her technique begins with a ‘prop’, either architectural or found object, against which clay is thrown. Throwing is instinctive; McLeod is bypassing the brain and engaging the animal self (or other). The resultant clay forms are then observed and interpreted until a figure emerges. A model is then filmed shifting and moving in the pose, from which stills are taken to determine the final posture. 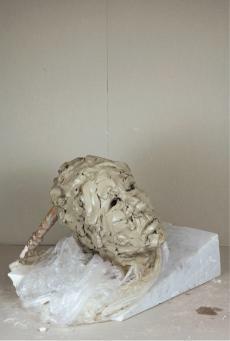 These images are used to model the clay into a rough figure. 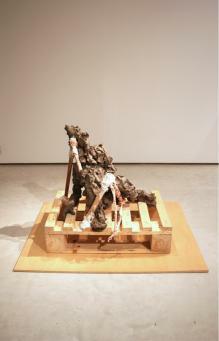 ‘Bracing’ supports the growth of the work, as an external armature. The dialogue between the figure, the bracing and the props is fundamental. After graduating with an honours degree from Goldsmiths College in 2005, McLeod went on to work for Anthony Caro. In 2007 she left Caro’s studio to study the MFA Sculpture course at the Slade School of Fine Art having been awarded AHRC funding. While at the Slade she was shortlisted for a Public Art award for British Land and attended a residency at Merz Barn, Ambleside. 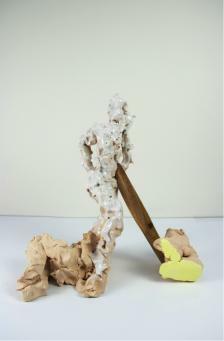 After graduating McLeod had her first solo exhibition at Postbox Gallery, London, which included a 7-day performance. 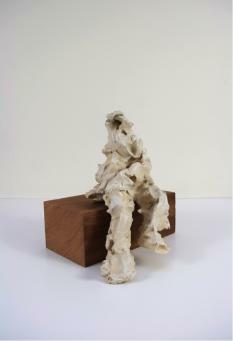 She has been awarded the Royal British Society of Sculptors 2011 Bursary Award and the 2012 Brian Mercer Bronze Residency, Pietrasanta, Italy. She has exhibited in the UK and Europe including the Northern Gallery for Contemporary Art, Eyestorm Gallery, RBS Galleries, WCA, ME108 Lisboa and recently a solo exhibition of ceramics at M2 Gallery, London.